It’s the Australia of his childhood. The Australia of the late 60’s and early ’70s. It’s a place of funny clothing and food that was appalling, but amusingly so. It also the land of staggeringly awful attitudes – often enshrined in law – towards anybody who didn’t fit in. Richard Glover has written a number of bestselling books, including In Bed with Jocasta and George Clooney’s Haircut and Other Cries for Help. His most recent book, the acclaimed memoir Flesh Wounds, was voted by viewers of ABC Television’s The Book Club as one of their Top 5 favourite books of the year. Richard also writes a weekly column for the Sydney Morning Herald and presents the Drive show on ABC Sydney. 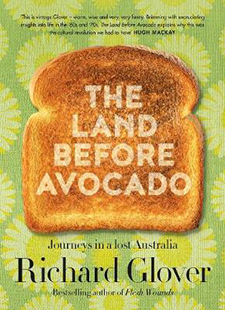 The Land Before Avocado is published by ABC Books and is available from all leading book retailers including Booktopia.